Head Scarves are fun, a great fashion look and a terrific way to pull your hair back! Two Make It Quick options are fast enough to make one for every outfit! The crocheted version is easy enough for beginners. Fabric scarves are easy as 1-2-3! Cut out a triangle, finish the edges, add a tie! 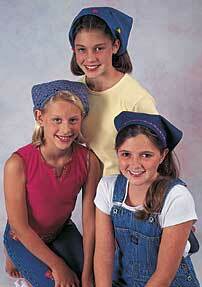 Then embellish with decorative trim, machine embroidery or crocheted flowers. Aunt Lydia's® "Denim" worsted weight thread, 75% cotton, 25% acrylic, Art. 152 (400 yard solids; 225 yard multi-color balls): 1 Ball No. 1056 Chambray will make several scarves. Crochet Hook: U.S. Size H-8 [5mm]. GAUGE: In pat  3 shells = 4"; 10 rows = 4". Finished Scarf measures approx. 18½" x 9". CHECK YOUR GAUGE. Use any size hook to obtain the gauge given. Ch 71. Row 1 (Wrong Side): Sc in 2nd ch from hook, * ch 3, skip next 2 ch, sc in next ch; rep from * across; turn  23 lps. Row 2: Ch 2, sc in lp, * ch 2, 3 dc in next lp, ch 2, sc in next lp; rep from * across; turn  11 shells. Row 3: Ch 2, sc in ch-2 sp, * ch 3, sc in next ch-2 sp; rep from * across (do not work in turning ch-2 sp); turn  21 lps. Rep Rows 2 and 3, decreasing 1 shell every right side row until 1 shell remains, end Row 2; DO NOT TURN. Edging/Ties-Rnd 1: Ch 1, 2 sc in each row end across shaped edge, 3 sc in corner, working across beg ch, work 2 sc in each sp and sc in each sc, 3 sc in next corner, 2 sc in each lp across next shaped edge, sc in next dc, 3 dc in next dc, sc in next dc, 2 sc in last sp; join to first sc. Rnd 2: Working in back lps only, ch 1, sl st in each sc to corner sc, * ch 51, sl st in 2nd ch from hook and in each ch across, sl st in last sc worked into *, sl st in each sc across straight edge to corner sc; rep from * to * once more; sl st in each sc to end; join. Fasten off. Weave in ends. Coats Dual Duty Plus® All-purpose Thread to match fabric. Coats Rayon Thread, several colors depending on design. Fabric: 3/8 Yard of 45" wide fabric for one scarf. 5/8 Yard of 45" wide fabric will make 4 scarves. 1. Cut out a right triangle, 17" x 17" x 23". Cut out a strip for the tie, 1½" x 45". Make It Quick Tip: Instead of making the tie, use Coats Extra Wide Double Fold Bias Tape. 2. Press ¼" to the wrong side on each short side of the triangle. Press a crease lengthwise down the center of the tie, wrong sides of fabric together. Press ¼" under on each short end, then press ¼" on the lengthwise edges under, raw edges meeting at center crease. Press the lengthwise crease again, with the raw edges folded to the middle. 3. Sew a narrow hem on the short sides of the triangle by folding the edges under again and stitching in place. 4. Mark the center of the tie and the center of the long side of the triangle with a pin. Slide the raw edge of the triangle into the fold of the tie matching the centers; pin in place. Stitch, beginning at the end of the tie and sewing the other end. Backstitch at each end. Make It Quick Tip: To make starting at the very end of the tie easier, place a piece of tear-away stabilizer or paper underneath the tie and hold the thread ends until you have sewn several stitches. 5. Embellish scarf with decorative stitching. Use a stabilizer underneath the fabric so that the stitches do not pucker. Other embellishment ideas: rick rack, hand embroidered design, applique crocheted flowers (pattern below). SOUTH MAID® size 10 thread, 100% mercerized cotton, Art. D54 (300, 350 and 400 yard balls): Small amounts each No. 491 Christmas Red, No. 499 Lemon Peel, No. 432 Candy Pink and No. 250 Mexicana. Steelite® Crochet Hook: U.S. Size 3 [2.1mm]. GAUGE: Flowers measure approx. ¾" in diameter. Ch 4; join with a sl st to form a ring. Work 5 petals in ring as follows: * ch 2, [yo and draw up a lp, yo and draw through 2 lps] twice in ring, yo and draw through all 3 lps on hook, ch 2, sl st in ring  petal made; rep from * 4 more times. Fasten off. Sew to scarf as pictured. ABBREVIATIONS: approx. = approximately; beg = beginning; ch = chain; dc = double crochet; lp(s) = loop(s); pat = pattern; rep = repeat; rnd = round; sc = single crochet; sl st = slip stitch; sp = space; st(s) = stitch(es); yo = yarn over. * or ** Repeat whatever follows the * or ** as indicate. [ ] Work directions given in brackets the number of times specified.